Under Crowninshield, Vanity Fair became iconic, influencing everything from The New Yorker (once a competitor, now a sister Conde magazine, also available on Flipboard) to Life magazine. It published the best writers of its day — Dorothy Parker, Aldous Huxley, F. Scott Fitzgerald, T. S. Eliot, among others, and at its peak, enjoyed more ad pages per issue than any of its peers. And yet, for all its excellence, it did not survive the Depression: Nast folded it into Vogue in 1936, where it remained for nearly 50 years. 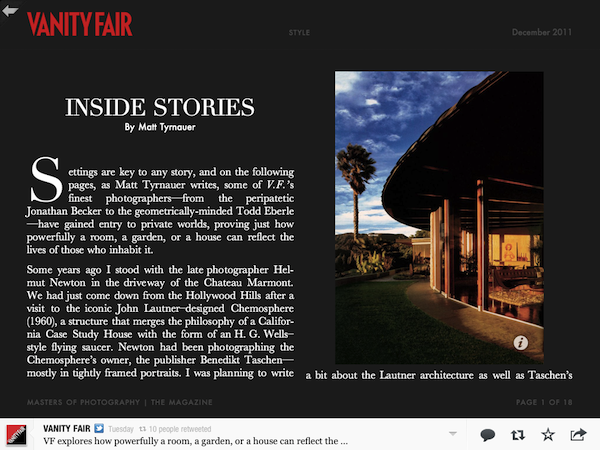 Relaunched in 1983, Vanity Fair went on to dominate the national conversation, first under Tina Brown and then Graydon Carter, who edits it to this day. Tap below to read Vanity Fair on Flipboard. If you like what you see, tap â€œ+Addâ€ to place it in your favorites for future reading.